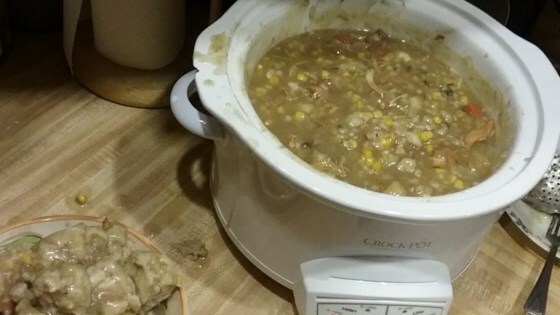 "A tasty soup made from leftover turkey, topped with delicious dumplings." Place the turkey, onion, celery, potatoes, carrots, corn, poultry seasoning, onion powder, and garlic powder into a slow cooker, and pour the chicken stock over the turkey and vegetables. Mix well and season to taste with salt and black pepper. Set the cooker on Low, cover, and cook until the vegetables are tender, about 6 hours. Whisk the flour, baking powder, and 1 teaspoon of salt together in a bowl, and mix in the melted butter. Stir the dumpling dough until it begins to firm up, 1 to 2 minutes. Drop the dough by tablespoon into the simmering soup. Replace lid; simmer about 15 minutes. A deliciously easy chicken tortilla soup recipe with your favorite ingredients. Excellent!! I used box biscuit/dumpling mix instead of the dumpling recipe since there were some that altered it. Total hit with everyone!! I made this and thought it was yummy!!! The dumpling recipe was a little off but I kept adding melted butter until it was doughy. Thank you for the recipe.